NASA launched the final mission of the space shuttle Atlantis on July 8, 2011, bringing an end to the American space flight program. So what’s it actually like to go into space? Here, astronaut Mike Good shares his answer to this question. Good has gone on two space shuttle missions on Atlantis. On the first, in May of 2009, he serviced the Hubble Space Telescope. 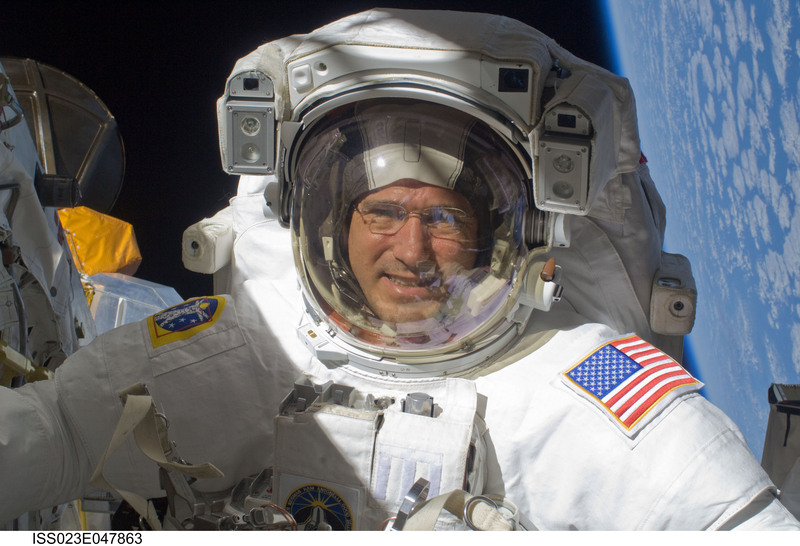 In May of 2010, he took equipment and supplies to the International Space Station. Now, he works as the NASA liaison to Air Force Space Command and NORTHCOM-NORAD at Peterson Air Force Base in Colorado Springs, Colorado. 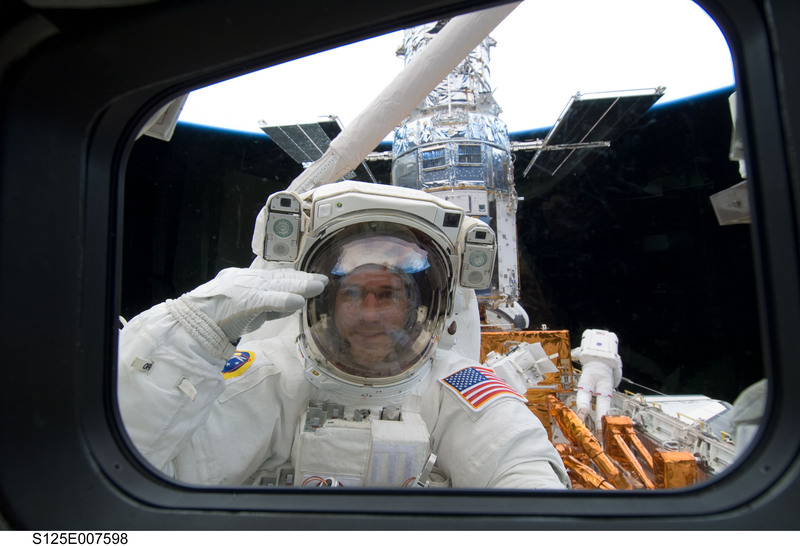 Mike Good on a spacewalk outside the shuttle Atlantis. Photo courtesy of Mike Good. The space shuttle launch is a really exciting time for us. It’s like our Superbowl: We’ve trained really hard for this, and it’s a big deal for us. We want to do well. We want to win the game. Going out in the van to the launchpad — we call it the Astrovan — is kind of a somber time. You realize you’re going out to do something pretty important, and it’s a little risky too. People sometimes ask if I was scared. I wasn’t really scared, I was just very focused and excited, anticipating this big event. We got to the launchpad and got strapped into the shuttle. On my last mission, I was the last one to get strapped in, so I had time to hang out at the pad at the 195-foot level while I was waiting to get in the vehicle. It’s a beautiful view up there. I took in the breeze, looked out at the Florida coastline, and thought about how in a couple of hours, this rocket was going to launch me off the planet. It was pretty cool. You get in the vehicle and get strapped in, and then you’re lying there on your back for a couple hours before launch. The guys do a few checks and then close up the hatch, which is a long process. All of those guys leave the pad an hour before launch, and then you’re really on your own. The closest person is a couple of miles away. There’s not a lot to do while you’re waiting for the launch. You’d think lying in the seat on your back would be relaxing, but for me it got pretty uncomfortable. The orange pressure suits that we wear for launch and reentry have air bottles in them, and you’re lying on your parachute and it’s kind of lumpy. You’re sitting shoulder to shoulder with your fellow crewmembers, and it’s also kind of a weird position to be in — you’re sitting in your chair, but it’s tipped back so that the nose of the shuttle is up. I couldn’t wait to launch so that I could get out of the seat and out of the suit. When you get to nine minutes from launch, things start happening really fast. Time speeds up — it feels like just a few seconds. The engine’s light, and you just get kicked off that pad. It’s hard to describe how much power is in that launch. Watching it, especially on TV, it looks like we’re just lumbering off the pad, but by the time we clear the pad we’re already going 100 miles an hour, and we keep accelerating so quickly from there. The whole ride to space is only eight and a half minutes; you go from 0 to 17,500 miles an hour in eight and a half minutes, so it’s a constant acceleration. It’s kind of like those amusement park rides that give you that sense of acceleration for a few seconds, but this is sustained over that entire period. You get up to feeling 3Gs — three times the force of gravity — on your chest. It’s going through the front of your chest and out your back, so it’s like there are three people lying on top of your chest. It actually gets a little tiring, and it’s kind of hard to breathe. You have to raise your chest up and down to breathe. Everything is more difficult with that force on you — reaching up your hand to flip switches, or trying to write something on your kneeboard with your pen. You keep going faster and faster, and as the fuel burns down, you’re getting lighter and lighter, which makes you go even faster. In the last couple of minutes, we actually have to throttle the main engines back to maintain the 3Gs on the vehicle and on our bodies, because the rocket just wants to keep going faster and faster, and it would end up tearing the rocket apart. Then, eight and a half minutes after the launch, boom! The engine’s cut off, and you go from 3Gs pushing you back in your seat to 0Gs, and you’re floating now in your straps and shoulder harness. For the next few weeks, you’re floating in space. It’s a great feeling. It’s actually a lot more fun than I expected. I didn’t really think about that before flight — I mean, I knew I would be floating around, but it’s really a lot of fun. Mike Good, repairing the Hubble Space Telescope. Photo courtesy of Mike Good. Being able to go outside on a spacewalk was by far the highlight of both of my missions. I went on two on the first mission and two on the second, and all four were totally different. On my first mission, we went to the Hubble Space Telescope. We met up with Hubble, brought it into our payload bay with our robotic arm, and went out and did spacewalks on it in the payload bay. It was kind of like our garage. On my first spacewalk, my partner, Mike Massimino, and I were both in the airlock together. We depressurized and opened the hatch into the payload bay, and I followed him out. I remember sticking my head out and taking that first step with my hands. I reached out and grabbed one of the handrails outside the hatch, and I was kind of on my back with my head sticking out. I was looking out the payload bay and looking back at the Earth. The Earth is about 300 miles away as we’re going around it, and it was so amazing to get that first peek at it, not through a window, just through my visor. I could see the whole horizon of the earth, all 360 degrees, and it was breathtaking and beautiful. I could see all those colors, all those blues and swirly clouds. I just kind of froze there, holding on, sticking my head out, looking back at the Earth. Then I realized I had to get my focus back. I looked at my hand and thought, ‘You know, you’re going to have to move that thing. You have to take your next step.’ I quickly got my focus back and was able to carry on with the spacewalk. You’re so focused on the task at hand that you almost have to make yourself take moments like that to look out in space, because if you didn’t, you’d just be looking at your work envelope a couple feet from your nose, and just looking at the tools and the task that you’re doing, and you could be anywhere. Out on a spacewalk, you feel kind of alone. You’re working with your partner and you’re talking to the guys on the ground and in the ship, but you also feel alone with your thoughts. You’re inside your spacesuit, and you hear yourself breathing, but you’re your own little spaceship out there, you’re your own satellite, because everything is self-contained in that suit. You have a tether attached to some structure to keep you from floating away, but not only are you floating in space, you’re outside on your own. It’s a pretty special experience. Now, I look at pictures that Hubble has taken with the new instruments we put in, and I think, ‘Wow, that is so cool,’ because first of all, we didn’t break it! There’s proof that we did not break it. But also, it’s the fruits of our labor to be able to bring those pictures back to everyone on Earth. We were the lucky ones who got to go up there and crawl around inside Hubble, and it’s rewarding to see the pictures coming back. It was a great team effort! On my second mission, we went to the International Space Station. We docked, opened up the hatches, and went inside. That thing is huge! It’s like a five-bedroom house, and you can fly around in there. I thought floating around the space shuttle on the middeck was pretty fun, but getting out in the space station, you can fly for 20 or 30 feet at a time without hitting anything. If you’re good, you can point and push off something, and you’re flying around like Superman. That was pretty amazing. Of course, when you first get there, you’re not very good at it. You’re banging into things, and people have to go around behind you and put things back on the wall. Everything’s pretty much Velcroed to the wall, so as you go by, your legs are banging into things and creating a big mess. But eventually you get better at it and get more control of your body, so you can go for longer distances without running into anything. There are up to six people who live and work on the International Space Station at a time, and they stay for six months. When we dock with the shuttle, we’re bringing another six or seven people. We docked on the third flight day, stayed for eight or nine days, and then had a couple days after we undocked before we came back home to Earth. For the residents, it’s kind of fun to have people come visit. We bring up a bunch of stuff for them, spare parts, food, water, fruit and veggies, which are always a big hit. They’re happy to see someone new, and that part’s pretty fun — there are lots of hugs coming and going. But it’s just like having visitors in your house — after a week or two you’re like, ‘Yeah, right, see you later, thanks for coming.’ It’s fun to have visitors, but it’s nice when they leave too. The reentry is just as exciting and dynamic as the launch. If you think about all the energy we put into the launch — we light those rockets and get all that thrust pushing us up into the atmosphere at 17,500 miles an hour — well, all that energy has to come back out of the system as we come back into the atmosphere and land. Like I said, we’re going around the Earth once every 90 minutes, and each time we go around, the Earth has turned underneath us a little bit, so we’re going over a different ground track with each rotation. We get to see quite a bit of the earth because of that. On the other hand, we’re 4,000 miles away from the runway when we start the landing procedure, and have to hope that by the time we get back to Earth, the runway’s below our wheels and we can make that landing. We have to slow down a little to come back into the atmosphere, so we turn around and do a burn in the direction we were going. That slows us down by 200 miles an hour, and that’s enough to help us dip down into the atmosphere just a little bit. There’s hardly any air up there, but we start running into a few stray molecules, which slows us down and brings us down a little bit lower to where the air’s a little bit thicker, then we run into more air molecules and that slows us down more and brings us lower, and the cycle continues. That’s all we do; we glide in that way. As we run into the atmosphere at such high speed, we actually create a plasma flow coming over the ship. It’s like we’re inside a fireball. Looking out the front windows, we can see the reddish-orange-pinkish color of this plasma flow coming over the ship — it’s as bright as the orange pressure suits that we’re wearing. It gets up to 3,000 degrees on the outside of the ship because all the energy we need to take out comes out in the form of heat. Inside, we’re still comfortable. That’s why the thermal protection system on the ship is so important. When Columbia had its accident, there was a hole in the wing from launch and no one knew, so when it ran into all those hot gases they were able to get inside the wing and cause that terrible tragedy. There have been two accidents, Challenger and Columbia, one going up and one coming down, so when you pass through that point on launch and reentry, you can’t help thinking about it a little. You’re not dwelling on it; you’re not tensed up waiting for it to happen, but when you pass through it’s a little bit of a relief: We made it to orbit, and we made it back home. Ever since I got back from my last mission, I’ve been wondering where to go from here now that the space shuttle program is ending. I’m flying down to the Cape in Florida for the last launch on Friday to work media and various public appearances, but really I’m going down there to watch the launch and watch four of my buddies go up there for the last time. For me, if I want to fly in space again, it’s probably going to be on the Russian Soyuz rocket going up to the space station for six months. Right now I’m trying to decide if that’s something I want to pursue. It’s a five-year process: going back to Houston, working in the office, getting assigned — and there’s no guarantee that I’d get assigned — and then it’s a two-and-a-half-year training program, half of which is going to Russia and training with the Russians and learning the language. Then there’s the six-month mission, and a six-month rehab when you get back. I know I could do the space station part of it — everyone who’s come back from the space station has said it’s a great life experience. But I’m trying to figure out if I want to pursue that, or go to work for another company, or do something totally different. It’s a pretty exciting time at NASA, even though the shuttle’s being retired. We’re going to keep flying to the space station, and we’re working on building a new vehicle that will get us further out into the solar system, back to the moon and asteroids and someday to Mars. In the meantime, NASA’s giving money to four different companies that are working on a commercial crewed vehicle. We’re going to keep flying to the space station at least through 2020, and we don’t want to have to rely on flying in foreign vehicles. There will be at least a five-year gap before any of that is ready, though. I hope that space tourism continues to develop. I want more people to get to experience what I experienced, to look back at the Earth from that perspective. From space, you can see the whole horizon, and you can really tell it’s a planet. You look at how thin the atmosphere is, and you realize how fragile the planet is. There are no lines on the map down there. You can see the natural borders, but you don’t see the countries, you just see the Earth. The Earth is our spaceship. We’re flying through space right now on this hunk of rock, and it doesn’t matter what language you speak or what country you come from. We’re all in this together, so we need to get along better and we need to take care of our spaceship. This is all we have. We’re the only living beings out there right now that we know of, so it’s important that we maintain the Earth and care for it. Going into space definitely changed my perspective and the way I look at the planet. When I look out my back window into the yard, or when I stare up at the sky, I imagine it as if I were 300 miles up looking back the other way. I think if more people had the opportunity to go into space and see the Earth from that perspective, it would be good for everybody. I don’t know if that will happen during my career with NASA, but I hope it’ll be in my lifetime. I hope we’ll get there. ← What’s it like to have an eating disorder? Interesting, timely view of an astronaut’s life. Never had such detail. Loved the part about space station visitors! And wonder if the space tourism idea will come true. Thanks, Laura! If you’re interested, here’s an article that talks some more about space tourism: http://www.ibtimes.com/articles/176863/20110708/nasa-space-shuttle-astronaut-tourism-flights-virgin-galactic-space-adventures.htm. That was interesting. It is so sad that there will be no more space shuttles. It is a part of our history now. Beautiful article and the way he expresses is even more beautiful. Thank you for sharing! Thank you! I agree, he described the experience beautifully. Thank you for your article! It is sad the space missions have come to an end but we all should keep it alive by visiting the Kennedy Space Center! Col. Michael Good is such a brilliant man. He has great intelligence yet, such a causality about him, I didn’t know who he was till the last 30 minutes of a flight from Or. to Tx. and assumed he may need psychiatric help until I was able to land in wi fi and verify! He was so nice to my little boy! Hi Amber. Thanks for sharing! How lucky that you got to randomly meet Col. Good. He was fascinating to speak to on the phone for this story, and I imagine he’d be wonderful in person as well. Hi. Thanks for this good post. Its sad to know that space missions have ended forever. NASA is thinking of new and better forms of space travels in the near future. Really great accessible article. I agree: one spaceship earth and we are all passengers together, brothers and sisters indeed – we need to get on better, we need to be more grateful and caring for/of our ship, we need to got into space to get that ‘300 mile looking back’ perspective to consolidate our decisions to care.